Good morning, fellow quilt lovers! 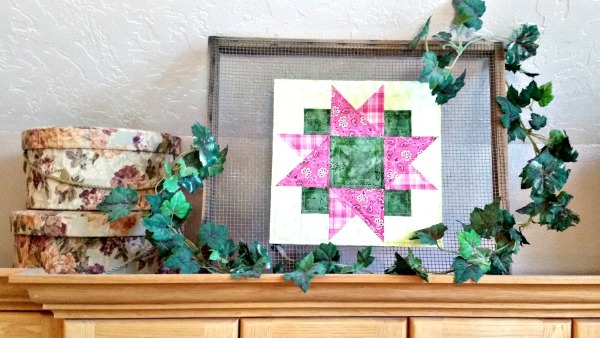 Today I want to tell you about different ways to display quilts in your home without hanging them on the wall. Last month, I showed you some beautiful quilts, but they were all large and required significant wall space to hang. Remember this quilt? I love the way it brightens up the room. But what do you do if you want to decorate with quilts, but you don’t have any large, unused walls? No need to fret. 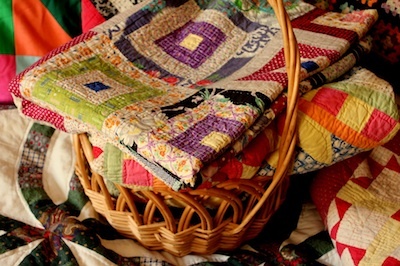 The photos below show examples of small quilts displayed in unusual ways. Enjoy! Our first quilt isn’t actually a finished quilt. 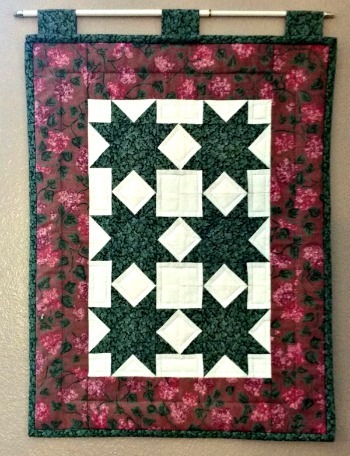 The home owner took a quilt block left over from another project, backed it with batting, and then added some simple quilting stitches. 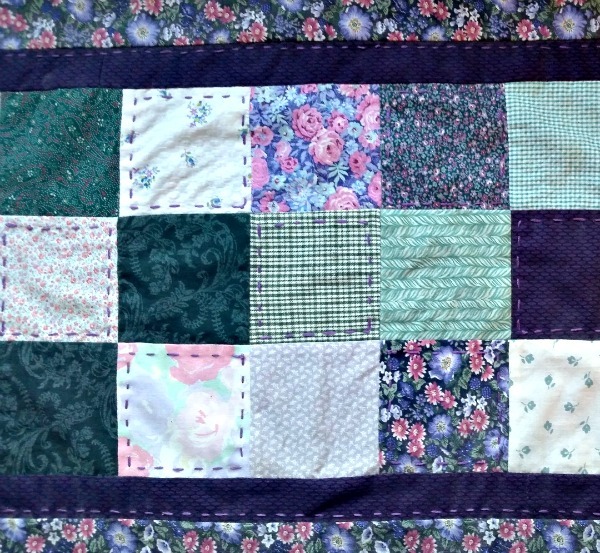 You would never guess that the quilt has never been bound—so the edges are raw—or that it doesn’t even have a back, just a piece of batting underneath the top. And this quilt is only 12 inches square. The quilt has been discretely pinned to an old, flat, wire bee tray and then set above the kitchen cabinets. Attaching the quilt to the wire tray allows the home owner to lean the quilt against a wall or to set it on top of her cabinets. (Quilts are too floppy to lean anywhere on their own.) Here is another quilt displayed the same way. This quilt is an extra square from a bear paw quilt. Again, it has no binding, no backing, just some batting and straight-line quilting. 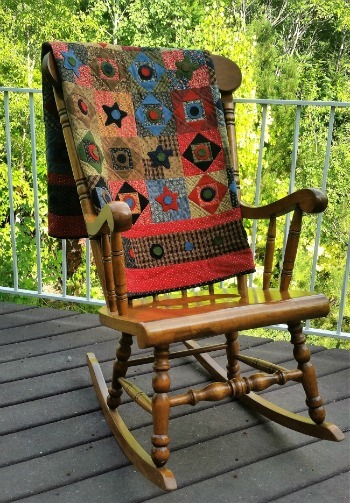 Another great way to display a quilt is to drape it over something, and the most common “somethings” are chairs of some kind. 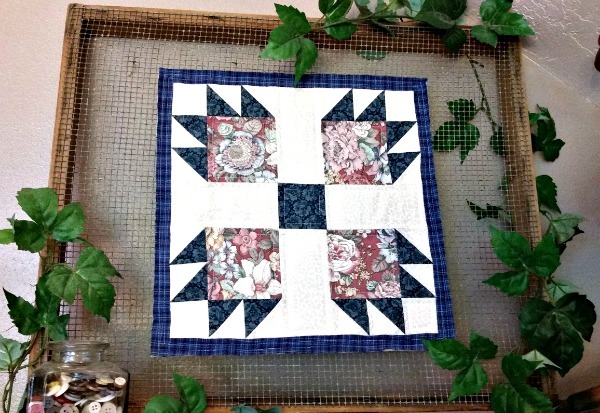 The quilt below is made from vintage-looking fabric and two different types of quilt squares: a square-within-a-square and four patch. These squares are embellished with felted wool stars and circles. You can actually drape a quilt over just about anything. The small quilt below has been arranged over a copper pot sitting on a book shelf. Here’s a photo of this same quilt spread flat on a table. It is 15 inches square, and the checkerboard squares in the quilt itself are 1½ inches. 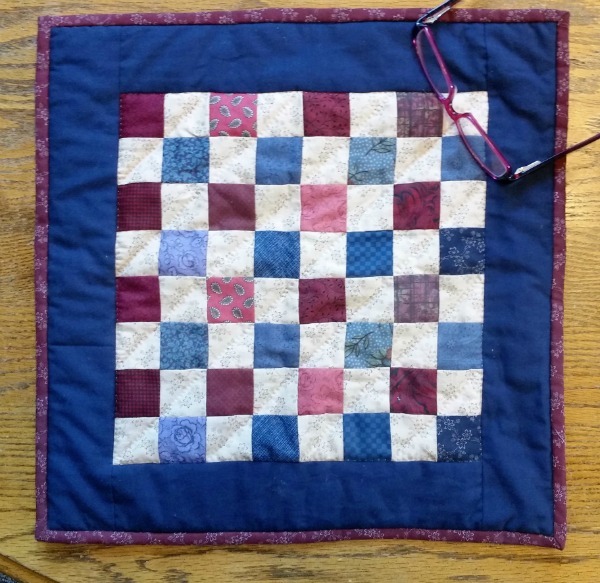 (The glasses are to help you see the relative size of the quilt.) 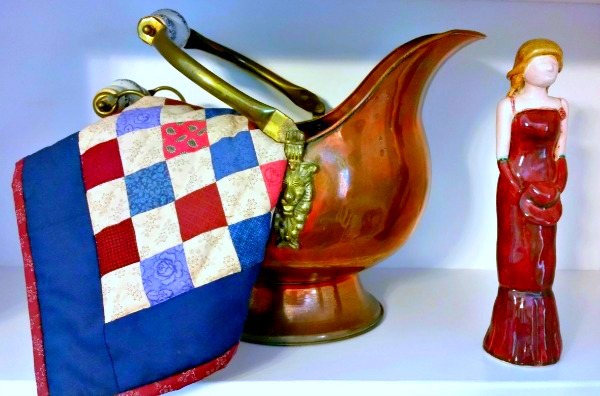 Do you like seeing the quilt draped over a pot, or would you rather see all the squares by displaying the quilt flat? 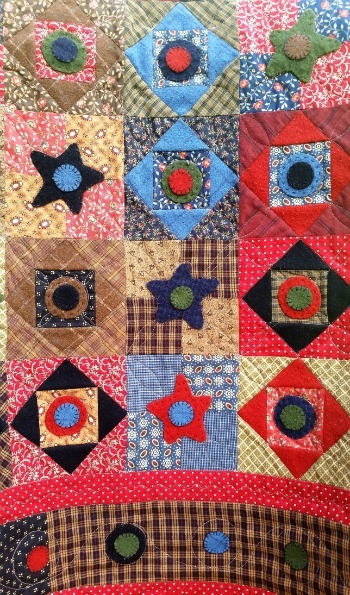 The quilt in the next photo is another orphan quilt block from a log cabin quilt. It is just 6 inches square, and it is draped over an old-fashioned, miniature baby buggy. 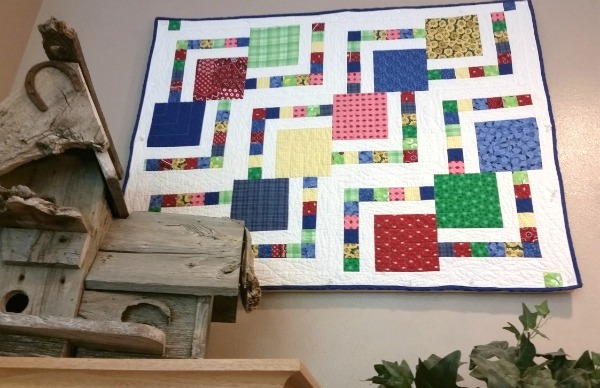 Small quilts also look great hung on the wall. The quilt in the photo below is a rectangle and measures 14” by 23”. And you’ll notice that the quilt has tabs at the top into which the homeowner has threaded a small curtain rod. The rod is then attached to the wall. 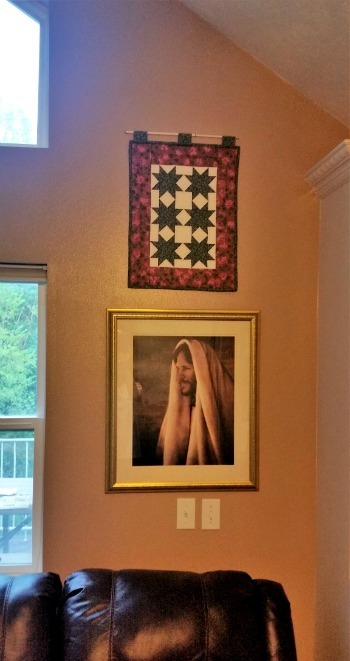 The home owner has paired this quilt with a formally-framed picture of Christ, and the colors in the quilt contrast nicely with the colors in the picture. 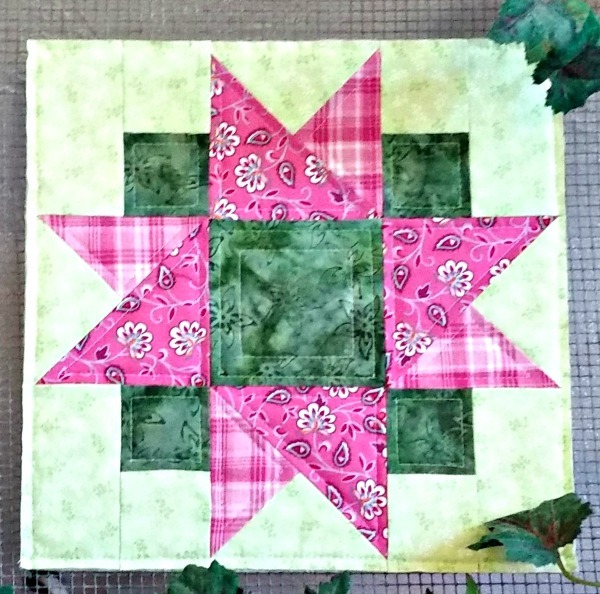 The last quilt for today is a simple table runner. I realize that displaying a quilt as a table runner isn’t really an original idea, but I love the homey feel of this quilt. And it looks right at home sitting on top of the antique sewing machine. Unlike the other quilts I’ve shown you today, this quilt was actually hand quilted with purple embroidery floss. Let the photos above inspire you to fill your home with beautiful quilts! Your house will thank you. 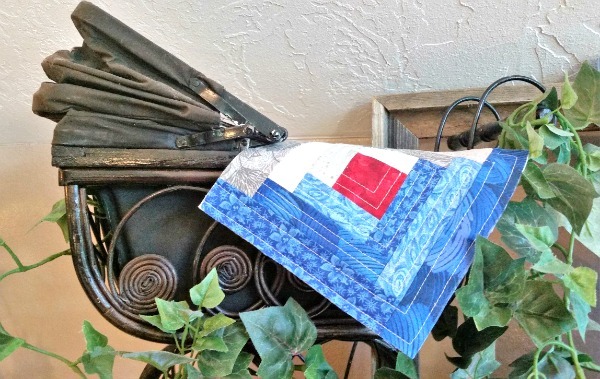 And join me next month for more quilting adventures at the Quilting Bee. Thanks, Mari. That was my sister Allison’s idea, and I think it’s darling.